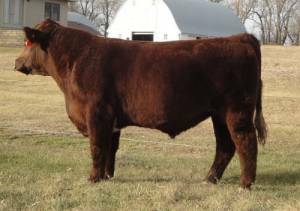 Here is a Solid Red, Smooth Polled, Low birth weight, asterick free son of Saskvalley Bonanza. He is a huge ribbed, deep middled bull that is sound as a cat. Remedy has all the attributes to be a breed leading AI Sire. With an actual Birth weight of 79 pounds we feel confident in using him on heifers and cows alike. This is the bull we have all been looking for! !